Waxahachie, Texas, is a community of approximately 33,000 residents just outside the southern suburbs of Dallas. The county seat of Ellis County straddles Interstate 356, offering residents easy access to points both north and south. The charming town square invokes the Texas spirit of a century ago. The Romanesque courthouse may be one of the most attractive of all of the state's many historic county courthouses. The settlement was founded in 1850 on land donated by Emory Rogers, an Alabama native that moved to Texas in the late 1830s. The population of the town greatly increased in the 1870s when a railroad spur linked the community to a growing Texas railroad network. In the early 1900s, Ellis County was one of the largest cotton-producing regions in the state, and Waxahatchie became the home of one of the first textile mills in Texas. Waxahatchie offers its residents 18 parks, including the rodeo complex on Howard Road and the sports complex. Those that enjoy hiking and biking can head to the Waxahachie Creek hike and Bike Trail, an eight-mile-long path that meanders from Lions Park to Getzendaner Park. Disc golfers can play the layout at Brown-Singleton Park, a 30-acre facility that also offers a linear walking trail. Boat Dock Park and Spring Park are both on Lake Waxahachie. The reservoir is located on Prong Creek, just two miles south of town. The lake covers 656 acres to a maximum depth of 48 feet. The lake's convenient location makes it easy for anglers to pursue their choice of crappie, white bass, largemouth bass, channel cats and blue catfish. In 2011, one lucky angler caught a lake record 12.31-pound largemouth bass. Avid golfers will find two 18-hole courses in the community. Waxahachie Country Club is a semi-private, 18 hole facility well-known for its rolling terrain and blind dog legs that will challenge golfers of all skill levels. The par-70 layout plays a modest 6,120 yards from the back tees. Red Oak Valley Golf Club is a public 18-hole layout featuring rolling terrain and creeks. The par 70 layout plays at about 5,900 yards from the longest tease. Red Oak Valley is perfect for those learning the game and others looking forward to a fun day with friends or family. Residents looking for indoor activities during times of inclement weather can head to the Ellis County Museum a fascinating and friendly facility. One exhibit highlights the growth of the community during the cotton boom it's located right on the town square surrounded by interesting boutiques, antique shops and restaurants. The courthouse is also located right on the town square. Other exhibits include artifacts from both world wars. In early June, the community celebrates its heritage of gingerbread homes with the Gingerbread Trail Festival. For almost half a century the tour. The event includes an antique market at the historic open-air Chautauqua Auditorium in Getzendaner Park. Artisans and craftsmen display their wares in the park as well. The Crape Myrtle Festival pays homage to Waxahachie's designation as the Crape Myrtle capital of the state. The event occurs around the July 4 celebration at the Waxahachie Sports Complex. On the morning of July 4, the parade down Main Street is accentuated by the crape myrtles in full bloom. After the parade everyone gathers at Getzendaner Park for free hotdogs. On the night of July 3, residents bring their lawn chairs and barbecue grills during the tailgate party and fireworks extravaganza that follows. For the last two decades, the annual Texas Country Reporter Festival has come to Waxahachie in late October. The big event features artists and craftsmen displaying their creations at the courthouse square. There are special games for the kids and lots of great food. Residents those relocating to the community have their choice of everything from classic Victorian residences to modern homes with all the amenities. At any one time, those relocating to Waxahachie will find a couple of hundred homes to select from. If you are drawn to the center of town, you'll find an interesting array of classic architectural styles, including Federalist and Georgian. The community's recent growth means that there's a fine selection of newer homes for sale, including those with amenities like multi-car garages, home theaters, gourmet kitchens and hot tubs. You'll also find custom-designed estate homes on acreage. If you're interested in building your dream home in Waxahatchie, you'll find excellent land parcels from which to choose. This is just a small sampling of all there is to do in Waxahachie and the surrounding areas. 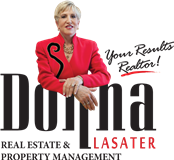 Please contact Donna Lasater for more information about the exciting lifestyle options in this thriving community south of Dallas. I look forward to meeting you!